Ahh...That bean bag liner is practical! "Last week we woke to 2 inches of water across our basement floor with one of your bean bag chairs sitting on the floor. Was disheartened to think we had to get rid of this great bean bag because 1. it wasn't cheap, and 2. its only about 4 months old. After it drying a bit, I was taking the cover off (thinking I could at least salvage the cover and just get new beans) and realized the insider liner was WATERPROOF! It was dry and did not have any odor! I washed up the cover and the whole chair is as good as new! Thank you for your awesome product......worth every penny!!!" - J.W. AHH Products has the original bean bags with washable covers plus "DWR" water-repellent liners made of the same material that many outerwear, weather-resistant coats use. Remember, our bean bags have lasted since 1998 with this original technology! Don't settle for less! This is our exclusive liner design! DWR stands for "Durable Water Repellency", which means that liquids bead up on our liners and roll right off. Sadly, even though to us this is the only logical type of liner for a bean bag, others on the market still only use a thin, weak cotton liner. Not only are these other liners not water-repellent, they aren't nearly as strong as ours. No wonder we have a 10 year warranty, compared to just a few years, or worse no warranty at all! Choose long term value, you will be glad you did! Here's a brief movie that shows our water-repel bean bag chair liners in action! Ahh! 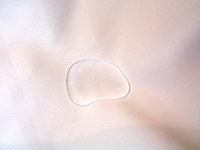 Products' Exclusive Water-repel Bean Bag Liner from Ahh Products on Vimeo. ...Next, we poured water on our bean bag liner into a puddle. See how it beads up and doesn't soak through? It sat like this overnight. "We got 4 of your chairs a year ago. Our basement flooded twice! All we did was wash the covers and they were fine. The liner kept the filling dry! No mildewy smell at all! You can use that as a satisfied testimonial!" -E.V. Now folks, we aren't telling you to leave your bean bags outside in the rain or to jump in the swimming pool with them. And if you do spill something, it's better to clean and dry it as soon as possible. With that said, don't you think it's a better choice to have our water-repellent liner protecting the filling when your kids do have an accident with that can of sticky soda or stinky milk? Sounds better than having a thin, cheap layer of fabric between your kids' mistakes and the filling, doesn't it? We agree!